Wilderness and wildness cannot exist without supportive rural economies. Research from economists such as Dr. Thomas Powers (see Lost Landscapes and Failed Economies: The Search for a Value of Place) indicate that communities are more sustainable and enjoy a greater quality of life when they are formed because of the regional quality of life. Conversely, they become less sustainable when their economies are dependent on the boom or bust nature of extractive industries such as timber, mining, and energy extraction. We at Cascadia Wildlands have always supported “good jobs.” These are jobs that enrich peoples’ lives, support the quality of life in rural communities, and do little to compromise the health of humans and the ecosystems that support them. This is one of the core reasons that we support meeting timber harvest goals on public lands by conducting restoration thinning in plantation stands as well as employing people to restore past damage and enhance amenities such as fisheries and other recreational values. We also advocate for replacing or removing failing culverts, which improves fish habitat and decommissioning harmful roads that act as noxious weed vectors and siltation sources. 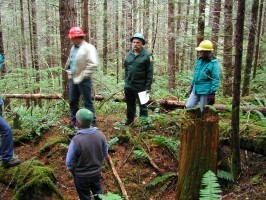 It is all part of a restoration-driven economy that we envision in Cascadia. People living in rural areas should not suffer and have their health, safety and quality of life put at risk to enable global corporations to make larger profits in an economy that has the rest of us reeling. These are added reasons why we oppose actions such as liquefied natural gas pipelines for export, fracking for natural gas, coal export terminals, and clearcutting and pesticide use near private lands. Rural communities should not see their lands condemned for pipelines, air polluted by deadly diesel particulates, and waters compromised by coal dust so that a few people can become richer faster. The current fiscal meltdown in several western Oregon counties is tragic and painful to watch. That said it was also a train wreck that should have been anticipated by our leaders. Centuries-old trees should not be cut down to fund libraries and jail beds, period. Leaders should have recognized this fact before sensitive species became imperiled by overharvesting and undertaken several actions including budget reductions, adjustment of timber revenue expectations, and incremental adjustments in taxation. Now that the meltdown has happened we are very concerned that Big Timber is going to pressure law-makers to step away from the reasonable protections established for our public forestlands over the past several decades. Our more rational solution to this crisis is outlined in a document called Shared Responsibility: The Conservation Community’s Recommendations to Equitable Resolve the O&C County Funding Controversy. We strongly feel that our approach will be viewed more favorably by future generations than approaches that simply return to elements of the failed past such as clearcutting. We need to keep on a forward-looking path rather than thinking that these past practices hold any promise for us and the ecosystems that we depend on for clean air, water, carbon storage for a livable climate, and more.